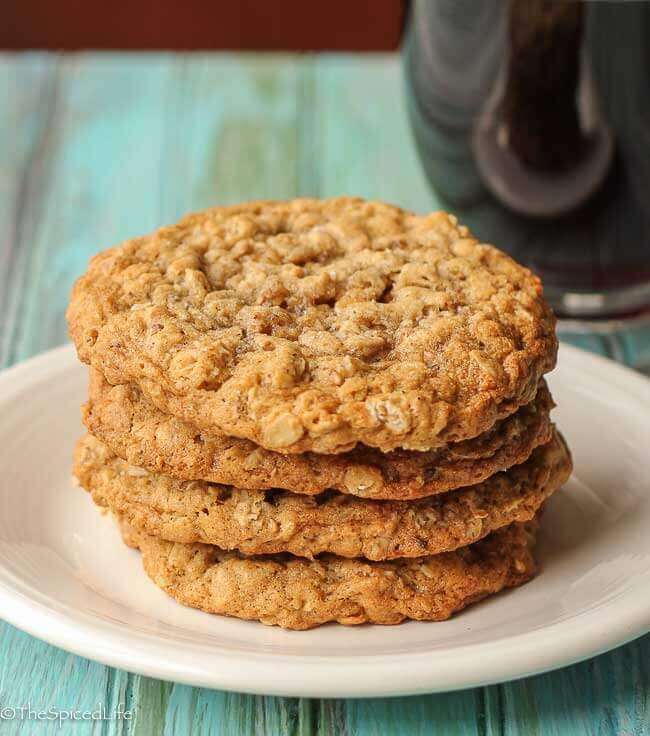 Sesame Oatmeal Cookies, subtly fragrant with cardamom and nutty with tahini, are a fantastic twist on traditional American oatmeal cookies (and can be made with chocolate chips for a twist on chocolate chip cookies). A copy of Soframiz was sent to me by the publisher for the purpose of an honest review. Affiliate links have been used to link to items I am discussing. Guys I am so close to having news about where we will be living next year. I am so sorry for my extended silence–but between house drama, germs and general winter malaise, I have not been the best blogger lately. Currently the hold up, on the house anyway, is that a new well needs to be dug. But about Ana Sortun’s fabulous Soframiz: Vibrant Middle Eastern Recipes from Sofra Bakery and Cafe . Some of my dedicated readers might remember my love for her Spice: Flavors of the Eastern Mediterranean ; at any rate, Soframiz made it onto my wish list the before it was even released. So I was extra excited to realize that the review copies were being handled by Lisa Ekus, who has always been very kind about sending review copies to me. I was hoping for baked goods with a Middle Eastern twist, and in that Soframiz did not disappoint. I have many cookies and cakes bookmarked. The good news for you savory food lovers though is that Soframiz also contains a plethora of breakfast and lunch dishes, including savory flatbreads, pies and meze (small plates). If you enjoy Middle Eastern food, I can guarantee you will find something to love. I love Middle Eastern food, but I confess what I was excited about the most was Middle Eastern flavors in more traditional American baked goods. Tahini Shortbread, Sesame Cashew Bars, Almond Rose Cake and the hauntingly spiced Persian Love Cake are just a few of the examples I have bookmarked. 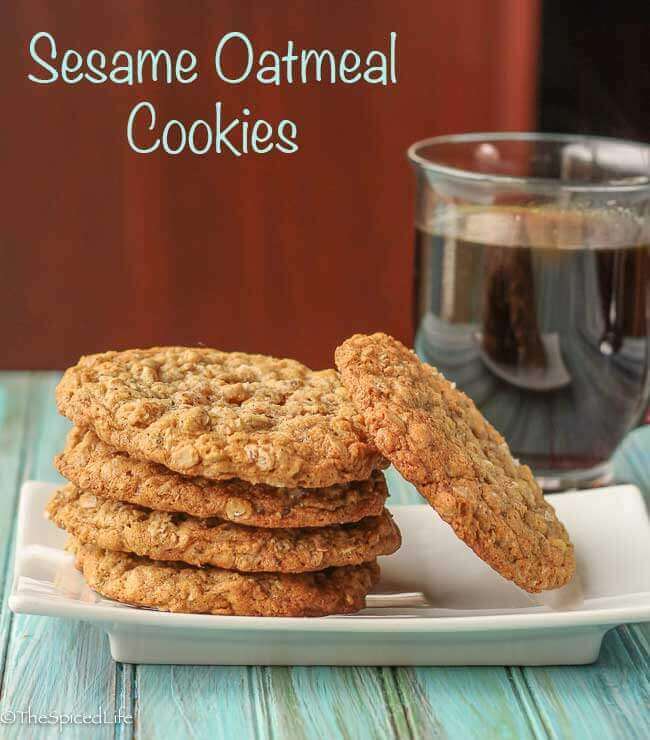 So it was no surprise that I immediately lit upon these Sesame Oatmeal Cookies to try. I am not sure what was more exciting, the cookies or getting to try halvah, which none of us had ever had before (next time maybe I will try to make it, but for now I just wanted to buy some for this recipe). The minute we did try it, we knew we were going to like the cookies. As a matter of fact, I am positive a dark chocolate would be amazing with halvah, and so next time I am skipping the cardamom Ana Sortun calls for and adding chocolate chips to the cookies. 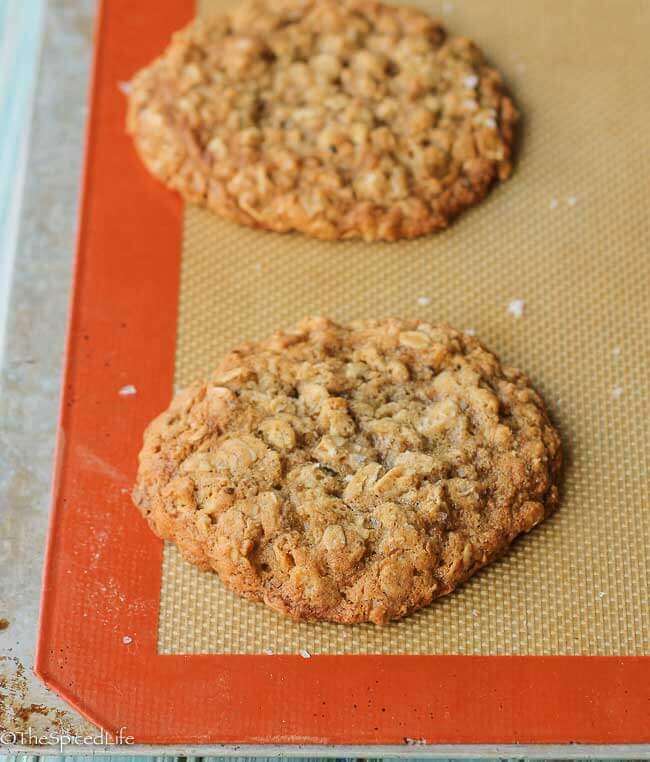 These Sesame Oatmeal Cookies were subtly spiced and not super sweet. Because of that, I preferred them for breakfast or tea. I bet if I made them with chocolate chips, however, I would want them for dessert. 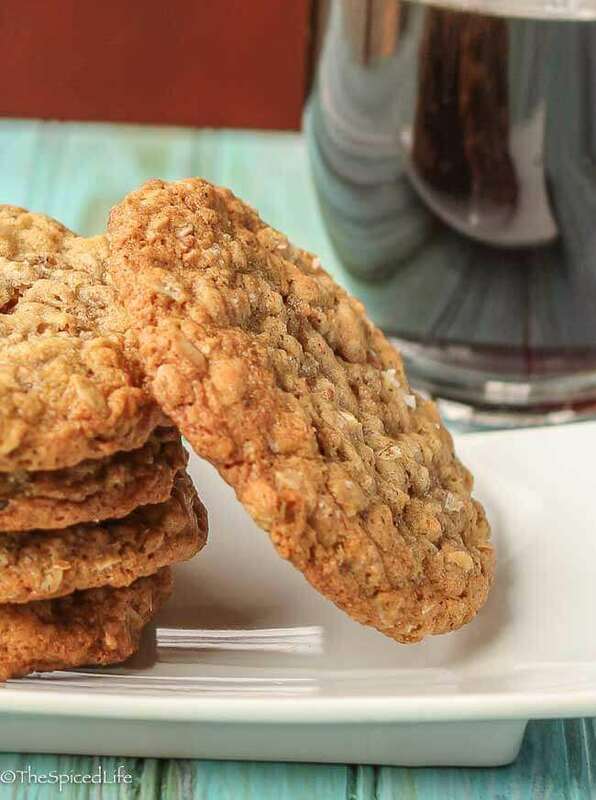 If you like peanut butter cookies, you should give these a try. And whatever you do, do not skip the halvah! Closely adapted from Ana Sortun. Sortun likes these with cardamom, but for a variation I think they would be fabulous without the cardamom but adding chocolate chips. Note this recipe requires at least 6 hours chilling time, which is not reflected in the prep and cook times. Whisk together the flour, baking soda, salt and cardamom (if using) in a medium-large bowl. Mix in the rolled oats, halveh and toasted sesame seeds. Set aside. Using a stand mixer, beat the butter, sugars and tahini on medium speed until smooth and lightened in color, about 5 minutes. Beat in the eggs one at a time, scraping the bottom and sides of the bowl in between each egg. Beat in the vanilla paste. Mix in the oat mixture in 3 additions on the lowest speed. Add the chocolate chips with the last bit of oats if using. When the mixture is evenly incorporated, cover with plastic and chill for at least 6 hours, until firm. When you are ready to bake, preheat the oven to 350 F. Line 2 baking sheets with parchment paper or silicone mats. 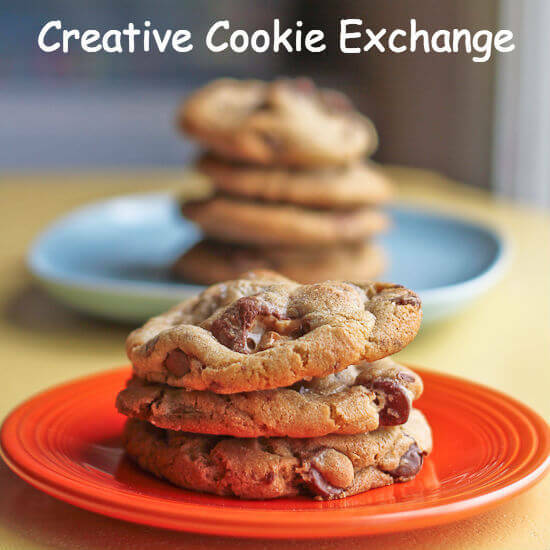 Scoop out balls of cookie dough--I like a scant 1/4 cup for this recipe, 6 balls to a cookie sheet. Press the balls slightly and sprinkle with a flaky sea salt. Bake until the cookies are only slightly browned at the edges and still look underdone in the middle, about 15 minutes. Let the cookies cool on the cookie sheet before storing in airtight containers. 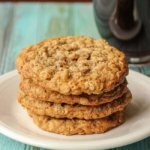 It is one of my favorite cookies in our book.